On Sunday, December 9th, seven VIU students and staff ushered in the holiday season at the Jingle All the Way 8K Race. 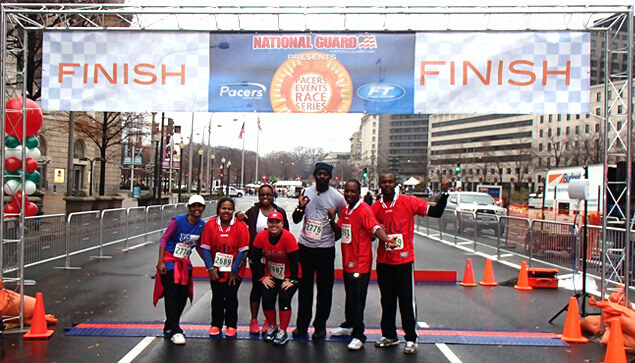 The race was held in downtown Washington, DC and included over 4,000 participants. Participants ran past the monuments the Capitol, and other DC landmarks. Even on a chilly and damp December morning, the racers were cheerful and excited, running to benefit the local Habitat for Humanity, a non-profit organization which builds homes for people in need. VIU students’ participation in the race was organized by the Office of Student Affairs and entry was sponsored by the university, one of its many initiatives to promote student spirit and support the local community. 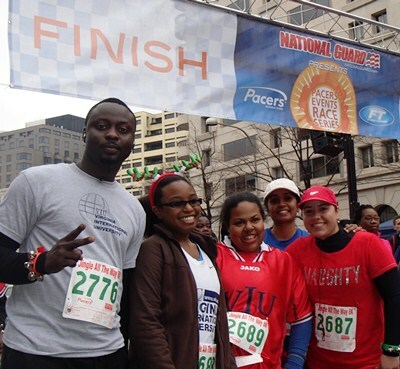 “Completing the 8k showed me that I can accomplish more than what I ask of myself. From the onset of the race I challenged myself to keep running no matter how slow the pace. Each mile that I completed was a testament to how faith and determination will literally take you a long way. The best part about completing the race was sharing the accomplishment with dear coworkers and students from VIU. 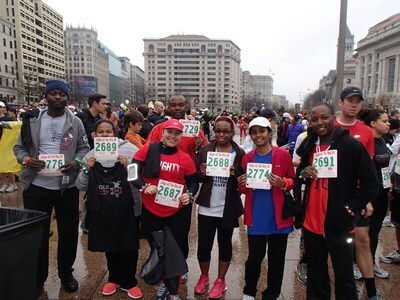 This experience has caused me to truly feel that I am a part of the team,” said Carla Jackson, an ESL faculty member. “The runners all came out in colorful attires; there were running elves, juggling Santas, running reindeer and even men running in suits. The VIU team was ably represented by Yanisse, Shareefa, Tiffaney, Carla, Dixon, Stan and my humble self, Folarin. We were there earlier to check in at the take-off point and also collect our bibs, which had our numbers displayed as well as an embedded microchip to monitor our performance. There was a DJ playing Christmas songs nearby and looking around, you can feel the euphoria. The audience, consisting mostly friends and family members were charged up and ready to cheer the runners to victory. The announcer instructed us to take our positions and the race started at 9:15am. Due to the large number of runners, many of us including myself had to start slow by walking until we had a clear path to run. It was a sight to behold, as you could clearly see the colorful crowd running all the way down the streets of DC towards the Capitol. We made a really long and colorful snake-line. The spectators were cheering on the Juggling Santa, a runner seen pushing two babies, the running reindeers, running elves all tied together, running suit men, a running couple in their sixties, the list goes on. By the time we reached the 2nd milestone, many runners were fatigued. Thankfully, there were helpers on hand to hand out cups of water! The DC Metro Police was also there to guide and monitor the traffic and paramedics were present in case anything went wrong. We all did our best and ran fast, hoping to at least get a good finish position; however the run was for charity and not competition. We came to the finish line, having run the whole 5 miles with average run time of one hour and thankfully, no one fell down or crumbled from exhaustion.